This year, the vibrant photography scene of Washington D.C. was complimented by Narrative: Contemporary Photography and the Art of Storytelling, a critically acclaimed show which ran earlier this fall at the Studio Gallery in Dupont Circle and featured American University Photography faculty as artists and curators. The show was favorably reviewed by the Washington Post, and the Washington City Paper named it one of the top 5 best photography shows of the year. This list also featured such illustrious offerings as the National Gallery's Sally Mann exhibition. Iwan Bagus, an AU M.A. Film and Media Arts alum and photography professor, co curated the show with Leena Jayaswal, professor and Photography program director. SOC faculty and alumni talent made up five of the 14 participants, who included Professors Alexandra Silverthorne, Kim Llerena and Shaun Schroth, and alumna Rania Razek. With the theme of the narrative, Bagus "want(ed) to push every artist to create new work or show their latest work that really tells a personal story" and "makes people stop and look at it and think about it." He wanted included artists to ask themselves what their images wanted, and what they made the viewer question. Professor Kim Llerena, who had two works in the show, used her images to explore relationships between historical markers and the sites they denoted. 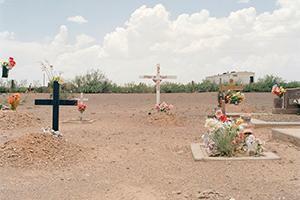 Her photos were taken on a Southwestern road trip of small roadside attractions, which she paired with her own "fake historical markers," exhibited under the prints. These markers have content pulled from the Wikipedia pages of those sites. "I was surprised that my image was used at the top of the City Paper article – yeah, that was pretty exciting!" Llerena said, of the positive reception to the show. "To have it featured as one of the best photo exhibits of 2018 in D.C. is huge because there's a lot of art galleries in D.C. That's not a small achievement." Jayaswal says that her and the other participants are "thrilled" with the coverage. "Not often do both the Washington Post and Washington City Paper review the same show, so we were so pleased by that." "It’s not every day that an exhibition showcasing 14 diverse artists offers consistently impressive work, but Studio Gallery’s group show… manages to pull it off," wrote Louis Jacobson for the City Paper. Mark Jenkins of the Washington Post wrote that Narrative "illustrates the many ways cameras can spin a tale."